With Drew Barrymore’s recent engagement, Bride’s magazine asked the nation’s hottest bridal designer’s to dream up a gown for the blushing bride. Here’s what our favorite new bridal designer, Hayley Paige had to say! 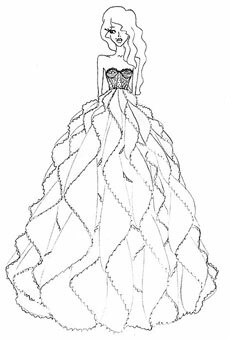 “Newcomer Hayley Paige was drawn to Drew’s fun-loving demeanor when designing this wedding gown, which she calls Coco. “Drew has an amazing sense of self and her wedding attire should emphasize that contagious charm,” says Paige. The sweetheart-style bodice and cascading ball gown skirt, comprised of eyelet lace and Swiss dot accents, emphasize the actress’s femininity.” We are thrilled to be the only bridal store, not only in Denver, but in all of Colorado that is carrying this amazing new designer!